But there was a problem – the dates clashed with a family commitment that was, in the eyes of my good lady wife, ‘important’. Messing around with this kind of ‘important family commitment’ could lead to serious consequences for me in ways I’d really rather not go into. And there, just like that. we were on our way: Me, the wife, Alfie (12), Sonny (11) and Coco (6). We’ll be like the von Trapp family in Sound Of Music, frolicking in the mountains and singing annoying songs about The War and stuff. Sophie will be the free spirited young Austrian woman studying to become a nun. I’ll be the Captain Georg von Sand Trapp, veteran Austrian captain whose wife died…., errm. Alfie, our oldest, well, he’ll be Liesl von Trapp who thinks he’s older than he is and is also in love with a messenger named Rolfe, hang on, that can’t be right. This is getting too complicated, let’s just get cracking. We arrive at Vienna airport and begin the hour-long car journey south to our first port of call: The Reiter Hotel & Golf & Country Club in Bad Tatzmannsdorf, Bergenland. We arrive to be accosted by a giant dancing goon in a reindeer costume, singing a song about Cashmere jumpers. Coco immediately flees the building in tears while the boys take it in turns to use reindeer man as a punch bag. We’ve only been here two minutes and it’s chaos already. Well, they have had a long journey. “Kasimer, it’s Kasimer!” everyone sings. It appears that reindeer-man is called Kasimer and his arrival in the hotel lobby is something to be celebrated. “Kasimer, he’s your best friend, Kasimer, you’ll smile in the end..” they sing. Not if Coco’s reaction is anything to go by, they won’t, mate. Then he’s off, skipping down the corridor towards the dining area with small children hanging off, like a furry Pied Piper. Welcome to Austria, Reiter Hotel style. One of life’s great feelings is waking up in a foreign country, having someone else make you a splendid breakfast and then strolling – strolling mind – to the first tee. Reiter’s Golf & Country Club is a masterstroke of serenity. Set in amongst sumptuous Bergenland woodland, 27 holes unwind for your golfing pleasure. We can’t wait to get out there. First I need some sticks. Reiter’s resident pro, Fausto, is clearly a man with a sense of humour. I asked for hire clubs but he takes one look at me, announces to anyone in earshot that I am a ‘big, strong boy’ and that I shall have the honour of using his actual clubs. Blades. 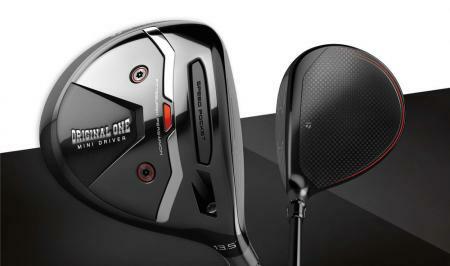 Stiff shafts. I plead for mercy but he’s having none of it. 45 minutes later I hit my sixth straight. My confidence was shot to bits. It’s amazing how fast the humiliation of not being able to cope on the golf course reaches into your very soul and starts pumping vast waves of panic and fear through your body. You just don’t know where to put yourself. What? How? Where did…? I don’t know what to do. Don’t know how to stand. Don’t know how to swing the… Jesus, … can’t think straight… feel faint, all anger replaced by paralyzing storm of chaos like a motorway pile up crunching through my brain. “Kasimir, it’s Kasimir, Kasimir, he’s your best friend”. Maybe no one saw. Everyone saw. Look down at ball. Decent lie. What difference will that make.?! As I draw back the nine-iron tentatively I can’t help thinking that Kasimir has got a lot of nerve for a bloke who makes his living prancing about in a reindeer suit. Does he even play golf? “No, but I do sometimes watch it on TV, Kasimir, it’s Kasimir..” Jesus I’m having an imaginary conversation with a man in a reindeer suit. By the time we finish I am an emotional wreck. I hand the clubs back in the pro shop, sit down at the bar and spend the next 10 minutes weeping quietly into a pint of Austrian beer. The next day we play the full 18, a really nice track that starts out on the high plain before weaving its way down into a valley alongside a river. Banking the fairways in the valley are vast cornfields where, apparently, they filmed a lot of the scenes for the kids fantasy movie Nanny McPhee. I feel obliged to tell you this as many of the local people seemed quite proud of it. As an all-inclusive destination this place is great. And by that I mean the wine is top notch. None of that booze cruise Liebfraumilch nonsense here. Everything you could possibly want was on tap and we could easily have stayed for another week. However, we had some important business at Golf Club Adamstal to attend to. After a tearful goodbye to Kasimir (no really, we promise we will write) and his brigade of cartoon numpties, we head off on the road to the mountains. 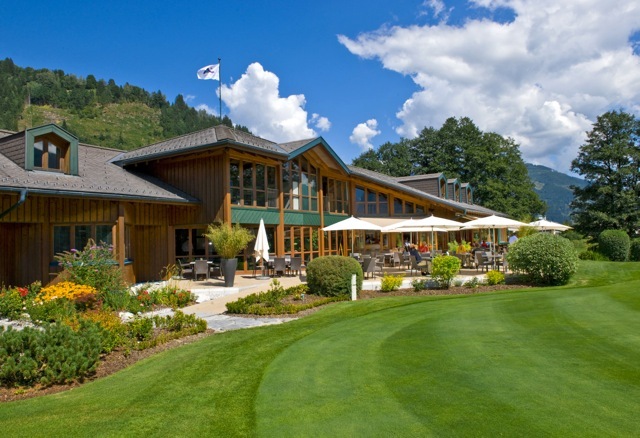 Golf Club Adamstal is situated in the heart of Austria’s Lower alpine foreland. Founded in 1995 by Austrian rally driver Franz Wittmann (what do you mean you’ve never heard of him?) 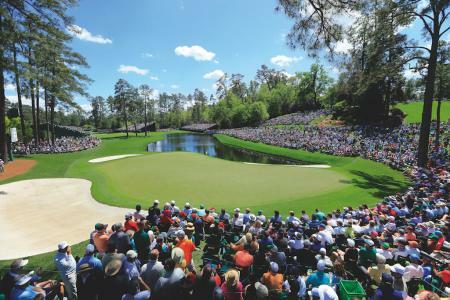 as a nine-hole course, it has now blossomed into one of Europe’s premier golf locations, hosting major tournaments and boasting 27 wondrous golf holes that wind up to amazing peaks and slope down again into sweeping valleys. Designed by Canadian Jeff Howes, a disciple of the Nicklaus design school, the course is immaculate, the greens smooth and quick and the views are simply breathtaking. All the holes have fitting names such as ‘Bear Ravine’, and ‘House Mountain Edge’. On the 12th tee we run into a German couple and are invited to play through as they are in no hurry. My tee shot on the 12th is a high cut straight into bear country. The German chap, a sturdy fellow who clearly likes a conversation, enquires as to what my occupation is. So I tell him: “I’m a golf journalist.” By the time we got to the green some 457 yards away, you could still hear the insane roar of his belly laugh, a laugh that can only occur when the worlds of extreme incredulity and utter pantomime disbelief collide. I really can’t imagine what prompted such a reaction. I’ll say no more about this place. You just have to come and play it. But make sure you bring you’re ‘A’ game. And an extra golf bag full of golf balls. And a helicopter. And probably a parachute. One minor swing slip and your ball sails off into the sort of sheer abyss only the most sure-footed mountain goat would attempt. As you head to the clubhouse you are gifted one more challenge: A bonus hole, a 160-yard par three played from a tee 500 feet above the green. It’s an incredible sight. And no, I didn’t make par there either. 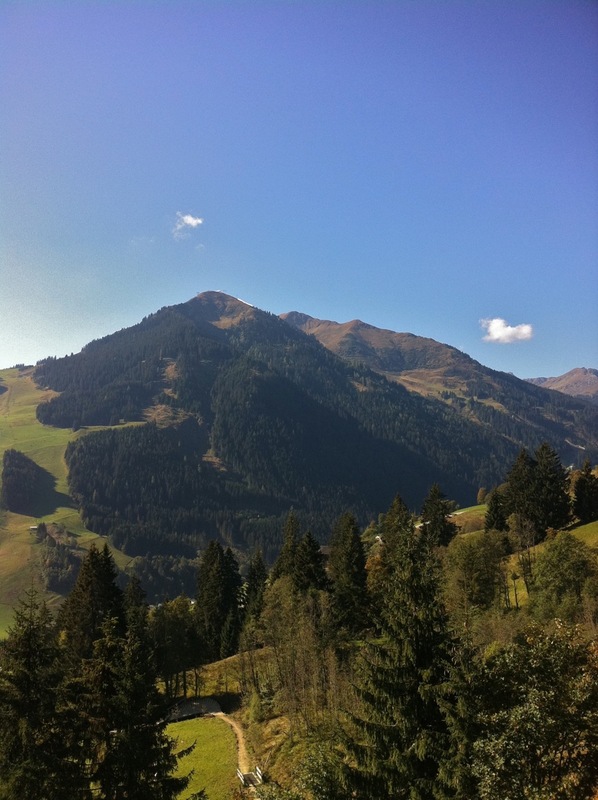 After 19 sensational holes we head southwest to Saalbach. This, we are advised, is real mountain country, the Adamstal experience a mere hors d'oeuvre in the going-up-high-&-experiencing-incredible-views stakes. We awake to the sounds of my children yelping with delight. The curtains are open and they are on the balcony. The pitch black of last night has given way to a beautiful sunny day. And the Alps. Right there. This is what we came for. We are surrounded by mountains and amazing green meadows. Cowbells clank in the distance. This is Austria. Within minutes they’ve hatched a plan to get the cable car up into the Pinzgau mountains and launch golf balls off the top. Off the tips: 6180 metres, par 73. Signature hole: 17th, 135-yard par three over a lake. Steep slope and a zippy green will draw an under hit tee shot back into the drink. Signature hole: The third, a 190 yarder down into the corner of a valley. Where to chill: It’s a resort, it’s chill central and all inclusive. Signature hole: All of them. Oh, OK then, the 5th ‘The House Mountain Edge’. This is the highest place on the golf course and the view is unreal. Oh, yes, also the 6th, ‘Wolf Potions’, a lovely 150-yard par three from an elevated tee over water. Behind the green, a sheer drop. I could go on. The beautiful 19th-century restored clubhouse. Have a drink and start plotting your new life in the mountains. 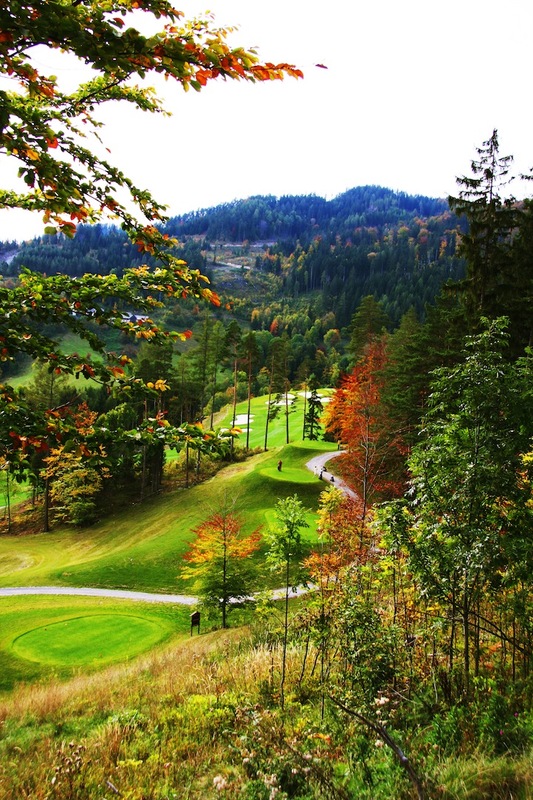 These two championship courses are a short drive from our hotel in Hinterglemm. We walked the course (there was a competition on when we stayed) and were blown away. Stunning. Off the tips: 6,262m, par 72. 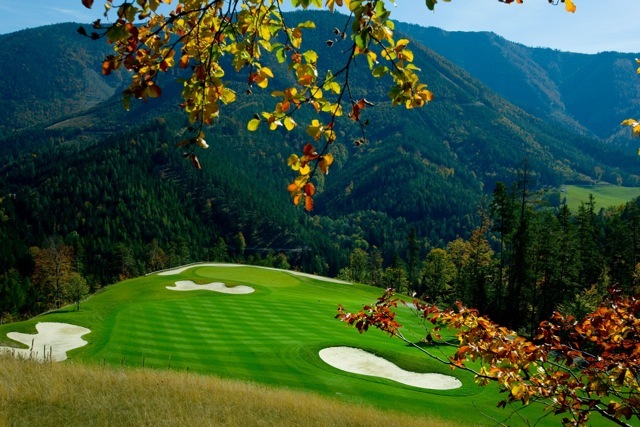 Quick overview: Both the courses here take their name from the nearby mountains and are characterised by glassy lakes and stunning mountain scenery. 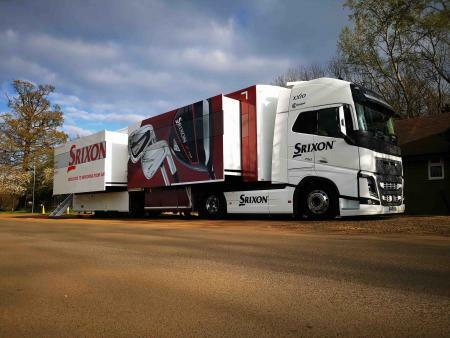 Greg Norman is a big fan of these courses, as was Seve Ballesteros. No wonder. They are immaculate and beautiful. Situated on the broad flat plain between Zell am See and Kaprun, Schmittenhöhe is the original creation and probably a sterner test than its sister course, Kitsteinhorn. 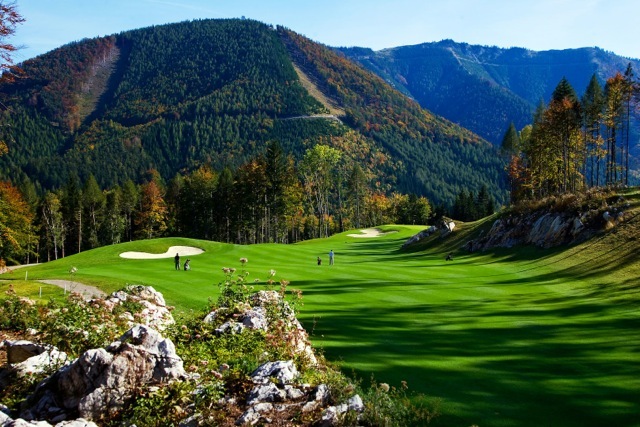 Schmittenhohe is characterised by narrow fairways and original winter hay barns – a unique, and certainly immovable, obstruction! Off the tips: 6.003 metres, par 73. Quick review: Kitzsteinhorn is a more recent addition with roomier fairways. Bit beware, the fairways are bordered by dense rough.. Where to eat: Sit on the patio of the clubhouse and enjoy a sunny lunch in full view of the Alps. Yes. There are two separate hotels here. The Avance is for families and the Superior is kid free so take you pick. Both are excellent and very, very friendly. This is a really lovely, family run hotel. There is a spa, every room is stylish and luxurious and the hotel is situated at the foot of the mountains.